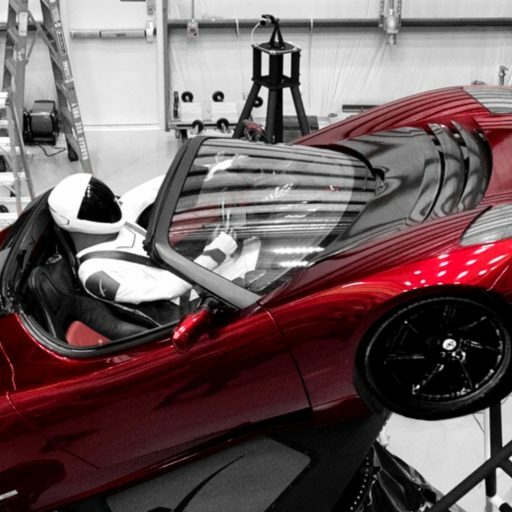 SpaceX went through a rigorous review process after the January 24 test firing to ensure the real-world data obtained from a plethora of sensors on the vehicle compared favorably to simulations and models developed by the company. The final Launch Readiness Review was held on Sunday and confirmed all was ready for the long-awaited mission – allowing Falcon Heavy to return to the storied Kennedy Space Center launch pad that hosted all Apollo missions to the lunar surface and the majority of Space Shuttle flights. In remarks to the press on Monday, Musk reaffirmed his 50-50 estimation of chances for a successful flight and Falcon Heavy not making it into orbit. 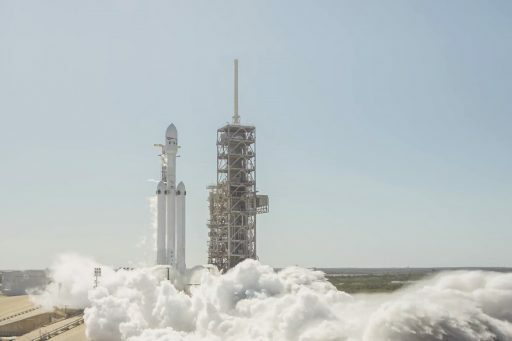 If all goes according to plan, Tuesday’s launch should make for some spectacular viewing and thousands are expected to descend on Florida’s Space Coast to witness Falcon Heavy take flight and experience the ground-shaking thrust as it rockets into the sky. 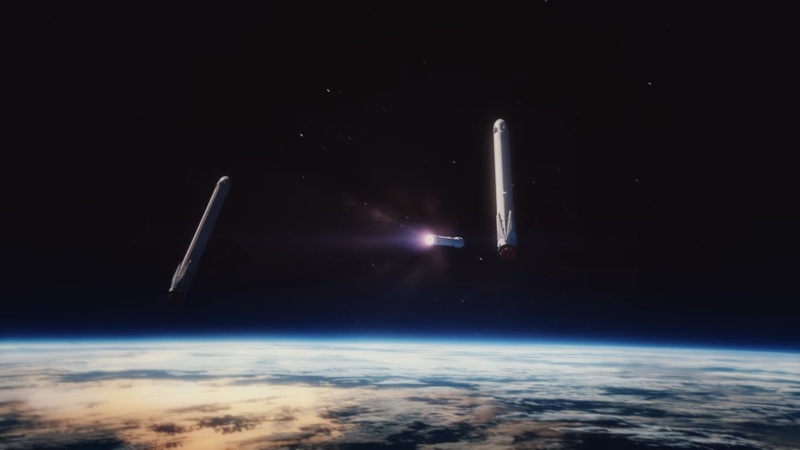 SpaceX plans to recover all three boosters on the Falcon Heavy rocket – the two side-mounted cores, both previously flown as individual Falcon 9 rockets, will make a rocket-powered U-turn to fly back to Cape Canaveral and land around 15 seconds apart on two concrete pads within SpaceX’s Landing Zone while the reinforced central core continues pushing the rocket and heads for a landing on the OCISLY Drone Ship positioned downrange from the launch pad. 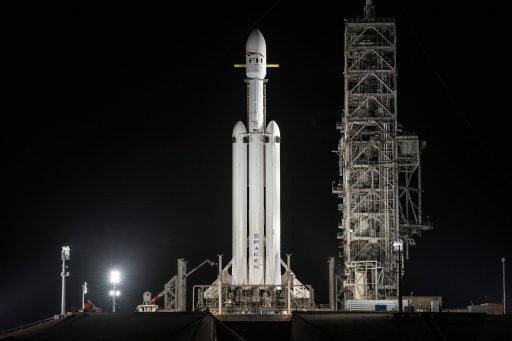 Falcon Heavy, when leaving the launch pad with a thrust of over 2,100 metric ton-force, will be the most powerful rocket of the current millennium, capable of sending nearly 64 metric tons into a Low Earth Orbit or dispatching over 16 metric tons toward Mars. “Only the Saturn V moon rocket, last flown in 1973, delivered more payload to orbit,” SpaceX said in a carefully worded statement to exclude Russia’s Buran/Polyus mission that lifted 80,000kg in 1987 but failed to make a stable orbit. 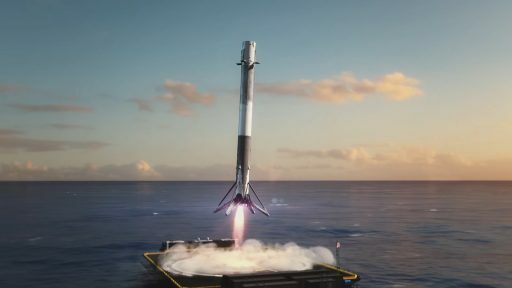 SpaceX offers a Falcon Heavy launch for a starting price of $90 million, coming at twice the performance and around a third of the cost of its main competitor, the Delta IV Heavy which can haul up to 29 metric tons into orbit owed in part to its use of the more energetic Liquid Oxygen / Liquid Hydrogen propellant combination. NASA’s upcoming monster rocket, the Space Launch System, will be capable of boosting up to 70 metric tons into orbit in its initial version launching in late 2019 or 2020. 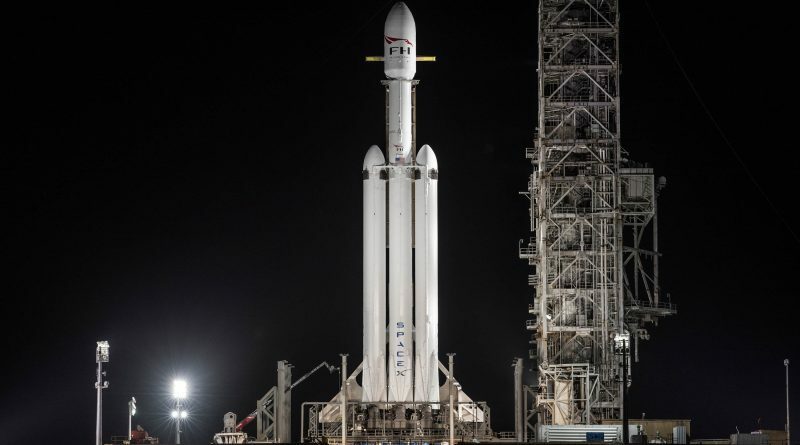 Falcon Heavy weighs in at 1,420 metric tons, stands 70 meters tall, has a span of 12.2 meters from side to side and comprises three 3.66-meter cores strapped together and a standard Falcon 9 second stage sitting atop, responsible for the final boost into orbit. All three cores are fully equipped for re-use, featuring grid fins for steering while flying through the atmosphere and four fold-out landing legs. 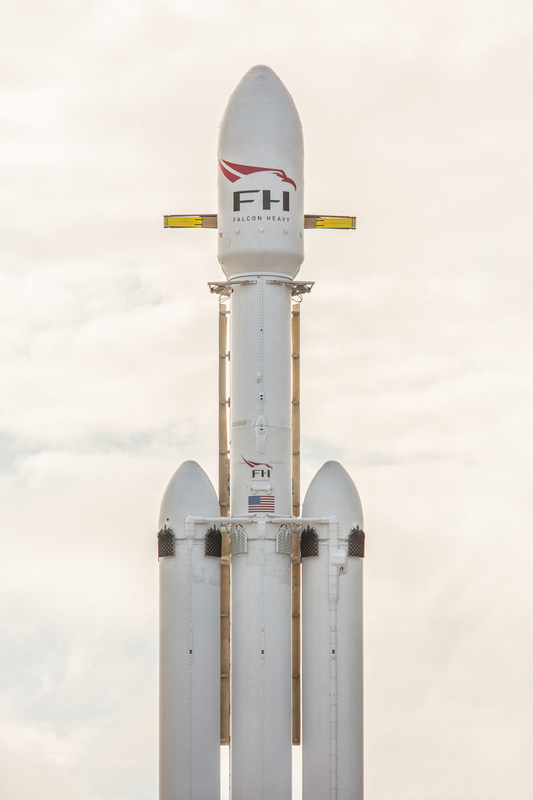 The inaugural Falcon Heavy launch vehicle features two previously-flown Falcon 9 stages as side boosters – having helped push a Dragon and Thaicom communications satellite into orbit – while the core stage is brand new and incorporates a number of reinforcements on its airframe to deal with the loads transferred from the side boosters. Much effort was put into modeling Falcon Heavy’s flight environments, but as Elon Musk stated, there is a long list of items that are “impossible to test on the ground.” Particular focus was on vehicle dynamics as the rocket has to deal with a tripling of the acoustic and vibration environment of Falcon 9, the loads experienced in flight will be vastly different from Falcon 9 in critical areas such as MaxQ and the trans-sonic flight regime, and the separation of the two side boosters was a completely new area for SpaceX. “This is one of those things that’s really difficult to test on the ground,” Musk said last year. “We can fire the engines on the ground and we can try to simulate the dynamics of having 27 instead of nine booster engines, and the airflow as it goes through transonic. It’s going to see heavy transonic buffet. How does it behave at Max-Q?” These and other open questions can only be answered by a test flight. 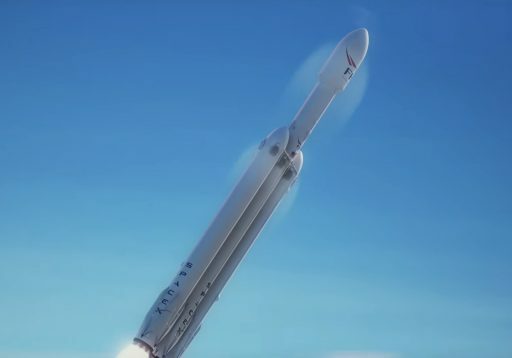 The sheer thrust generated by Falcon Heavy’s 27 Merlin 1D main engines puts the vehicle on the very top of the list of vehicle’s currently in operation, generating a launch thrust near 21 Meganewtons – surpassing Europe’s Ariane 5 that develops a liftoff thrust of 15 Meganewtons, Delta IV Heavy & its three RS-68A engines that create a launch thrust of 9.4 MN, and China’s new Long March 5 rocket with a peak thrust of 10.6 MN. 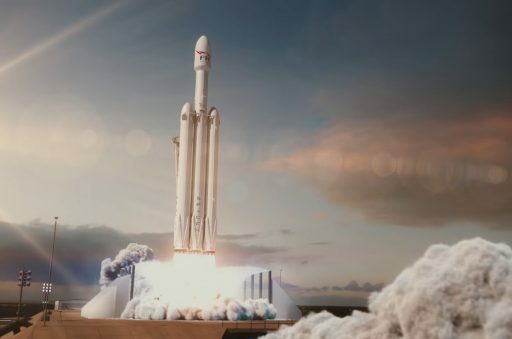 On the all-time list, Falcon Heavy will rank fourth, only surpassed by the Soviet N1 moon rocket that never flew successfully, the Apollo-era Saturn V, Russia’s Energia and the Space Shuttle with its Solid Rocket Booster assistance. Given the nature of the test flight and the energy possessed by the Falcon Heavy at liftoff, SpaceX was required to obtain additional insurance. According to the commercial launch license issued by the FAA, SpaceX must hold $110 million in third party liability insurance or otherwise demonstrate financial responsibility to cover property damages from a potential mishap. Additionally, the company holds $100 million in government property insurance and a $72 million policy to cover claims incurred during pre-flight operations at the Kennedy Space Center. Internal documentation sent out to the NASA workforce at the center informed teams that personnel is to shelter in place in case of an anomaly and avoid being next to glass windows and doors. The Launch Hazard Area enforced by the U.S. Air Force has been set up to keep the public safe in the event of an accident in the early flight phase and navigational warnings issued for the rocket’s flight corridor define a much larger hazard area than for a run-of-the-mill F9 mission with restricted areas stretching over 900 Kilometers into the Atlantic Ocean. 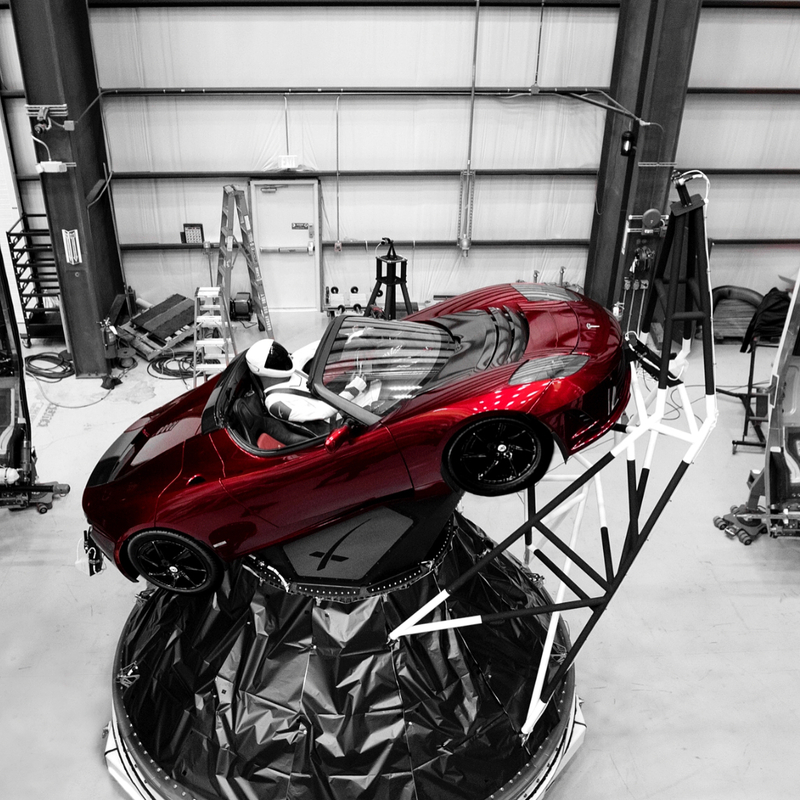 Instead of a boilerplate mass simulator, Falcon Heavy will carry a more colorful payload on Tuesday: Elon Musk’s used Tesla Roadster. If all goes well, the 1,300-Kilogram automobile will be injected into a hyperbolic escape trajectory, taking it into an elliptical orbit around the sun venturing out as far as the orbit of Mars but not actually coming close to Earth’s neighboring planet to comply with planetary protection guidelines. Launching esoteric payloads on their test flight missions is nothing new for SpaceX. The debut mission of the company’s Dragon spacecraft in 2010 flew a wheel of cheese to orbit and back in homage to a Monty Python comedy sketch. 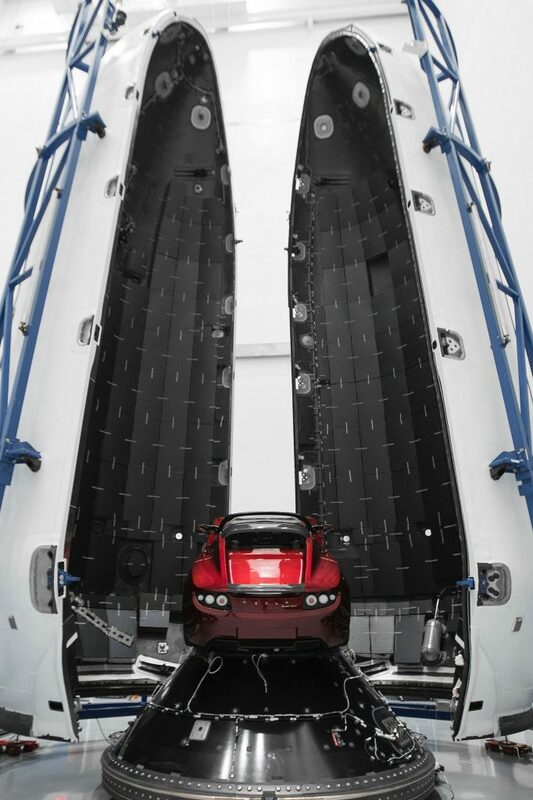 Lifting the Tesla into heliocentric orbit will not come close to exhausting Falcon Heavy’s lift capability and its launch could be easily handled by a Falcon 9. “I love the thought of a car drifting apparently endlessly through space and perhaps being discovered by an alien race millions of years in the future,” Musk Tweeted in December. SpaceX slowed the development of Falcon Heavy to focus on improvements of the company’s Falcon 9 workhorse, including groundbreaking work in the area of re-usability. 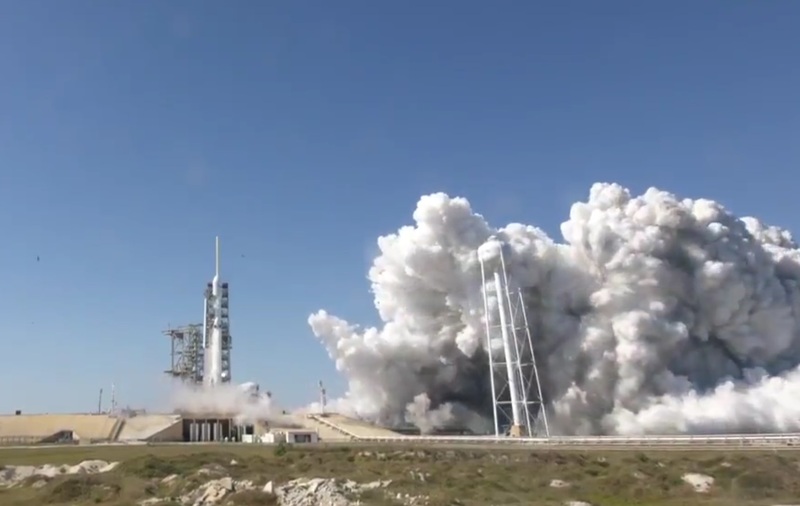 Technical problems that destroyed a pair of Falcon 9s in 2015 and 2016 put Falcon Heavy on the backburner once again as SpaceX focused all technical resources on returning Falcon 9 to flight. 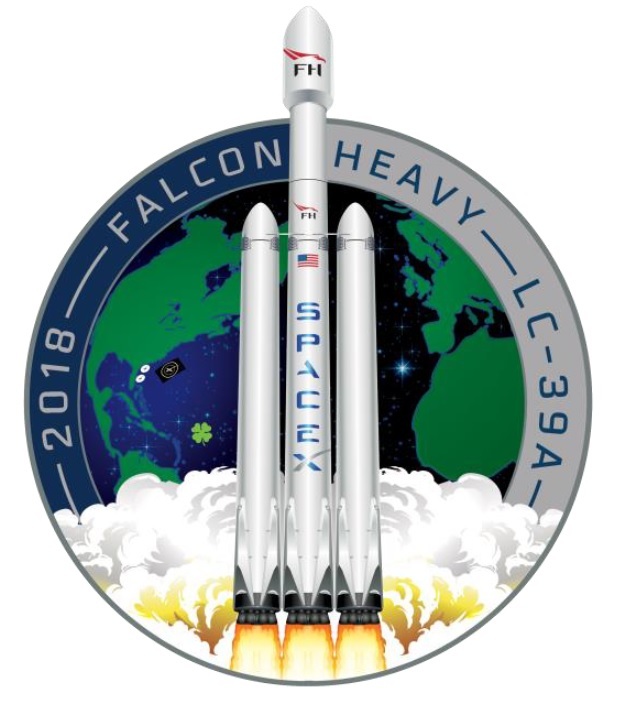 With Falcon 9 enjoying its busiest and most successful year to date in 2017, SpaceX could put the finishing touches on the Falcon Heavy launch vehicle and ready the ground infrastructure at Cape Canaveral to support the tri-core rocket. However, achieving liftoff is still another challenge to be met as SpaceX was so far only able to run through one countdown-to-ignition on the Falcon Heavy and there are a number of milestones that have to be checked off to allow the vehicle to rumble off – including a complex ignition sequence to get all 27 Merlins up and running. Weather is another factor that could come into the way of launch, though odds appear in SpaceX’s favor with an 80% chance of favorable conditions during the 2.5-hour window. The main weather concerns for Tuesday are liftoff winds and a slight chance of low-level clouds arriving from the ocean. Upper level winds will be from the west at 90 knots, 40,000 feet in altitude – slightly sporty but within the allowable range for Falcon 9 missions. In case of a 24-hour launch delay, odds of acceptable weather drop to 70%. As Falcon Heavy draws extensive heritage from the single-core Falcon 9 rocket, its countdown is set up in a similar fashion with the obvious changes of tanking two additional cores and completing avionics checks on two more boosters. 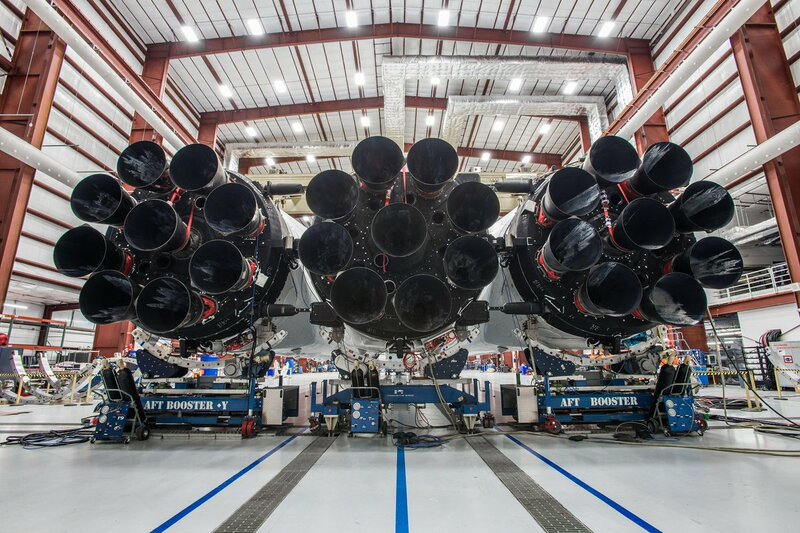 Countdown operations kick into gear around ten hours before the opening of the day’s launch window when Falcon Heavy will be powered up to enter a multi-hour checkout sequence – overseen by two Launch Control Rooms at the Cape and engineering support at SpaceX HQ in Hawthorne, California. Checkouts completed over the early countdown phase are focused on the avionics on the rocket’s three boosters and the second stage, communication checks will be performed for all the stages and the team will check out the rocket’s Autonomous Flight Safety System that would come into play should the triple-core vehicle veer off course or encounter any serious problems on the way up. 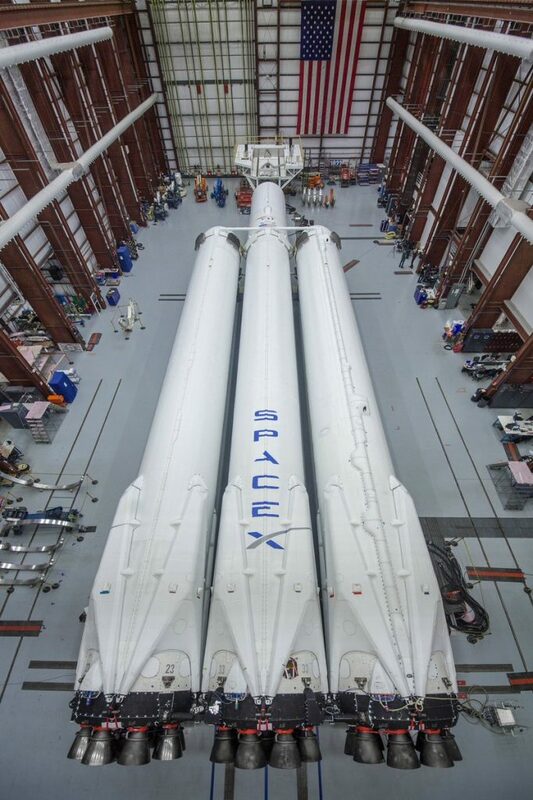 While Falcon Heavy is undergoing checkouts, teams at the launch pad will make the final physical reconfigurations to put all ground systems into the proper configuration for flight. The launch pad will be cleared by L-2 hours and Falcon Heavy will move through a second round of RF link checks and AFTS verifications as well as Hold Fire Checks with the Eastern Range’s Morrell Operations Center. A possible hold point at L-105 minutes could be used to defer T-0 later into the window in case additional work is needed to prepare for tanking. Propellant loading, although involving nearly three times the propellant mass of Falcon 9, only stretches the timeline in place for F9 by 15 minutes due to the use of densified Liquid Oxygen and Rocket Propellant 1 that can only remain in the rocket’s tanks for so long before warming excessively and resulting a decline of launch vehicle performance. The SpaceX team will move through polling at around T-88 minutes and the automated countdown sequencer assumes control of the complex tanking operation at T-85 minutes. Propellant loading starts with loading some 400 metric tons of Rocket Propellant 1, chilled to -7°C, into the three boosters via interfaces in the launch mount at the base of the rocket and into the second stage through the Strongback structure. Densified Liquid Oxygen, chilled to -207°C, will begin flowing into the three cores at T-45 minutes followed by the second stage at T-20 minutes to feed around 940 metric tons to the vehicle. As with Falcon 9, propellant loading is a carefully controlled sequence with lots of throttling in the flow rates – especially for LOX which is expected to close out on the boosters at T-3 and the second stage at T-2 minutes to ensure the vehicle achieves the maximum possible flight mass. The pace of countdown events will kick into high gear at the T-9-minute mark when the ground- and vehicle-based TEA-TEB ignition system will be primed to inject a self-igniting mixture into the 27 engines to initiate the combustion process. Hydraulics will step up to flight pressure via ground pressurization for a final test of the engine trim valves that set the propellant mixture and the second stage’s thrust vector control actuators that move the MVac nozzle to control the stage’s orientation. Pre-valves to the Merlin engines will open at T-7 minutes to begin the process of chilling down their turbomachinery using the supercold Liquid Oxygen to ensure a clean ignition can be achieved. 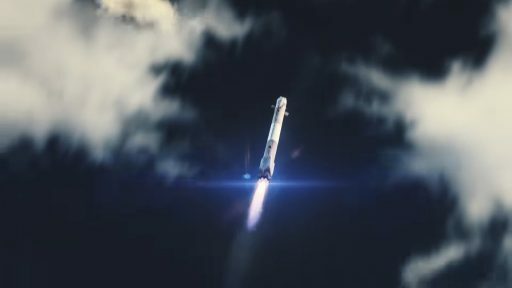 Falcon Heavy will top up its RP-1 tanks at T-6 minutes and the transition to internal power will begin shortly thereafter. Tanks will enter initial pressurization to add stability to the stack while the Strongback cradles open up and the large structure retracts by 1.5 degrees and is primed for a rapid kickback at the moment of hold-down release. The AFTS will switch to its own internal power source at T-3 minutes and go through its arming process by T-1 minute. As propellant loading closes out, Falcon Heavy will be isolated from ground systems inside T-2 minutes; gas close outs will occur half a minute later as Helium loading on the boosters and upper stage ends. Falcon Heavy will take control from ground computers at T-1 minute and enter final tank pressurization in preparation for takeoff. A final GO will be voiced from the Launch Director at T-45 seconds and the hands-off point for a human-commanded abort comes at T-10 seconds. Ignition will be commanded at T-5 seconds in a complex sequence that only ignites two engines at a time followed by another pair a few milliseconds later. This staggered ignition sequence is designed to avoid thrust-torques which – in a worst-case scenario – could rip the vehicle apart on the launch pad. Falcon Heavy’s computers will monitor the start-up and health of all 27 engines and permit the vehicle to lift off once all are verified to be at their 92% thrust setting chosen for this mission – giving the vehicle a launch thrust of 2,140 metric-ton-force. Rising from the historic LC-39A launch pad upon release of eight hold-down clamps, Falcon Heavy will climb vertically for just 15 seconds before entering its pitch and roll maneuvers that will align the vehicle with a launch azimuth almost straight to the east, aiming for a parking orbit inclination of 29 degrees. As the vehicle climbs away from Florida’s Space Coast, the central core will throttle its engines down in order to save propellants – a similar procedure is used by the Delta IV Heavy that reduces thrust on its central RS-68A to 57% of rated performance a minute into the flight in order to burn for another minute and a half after the boosters separate. 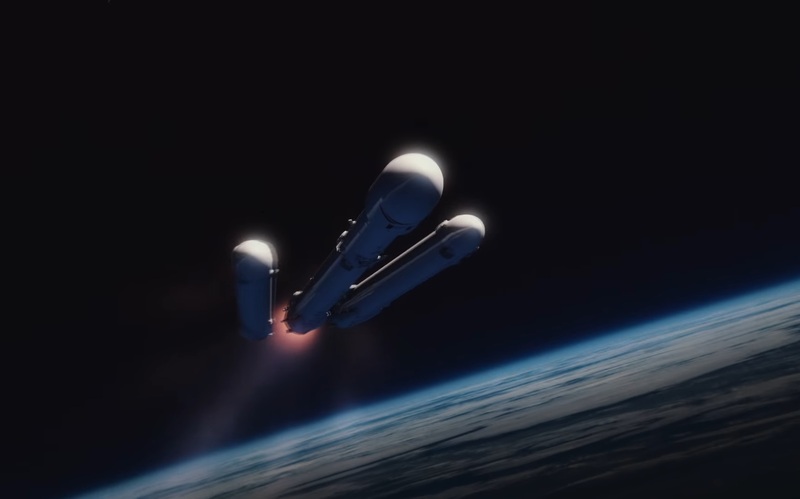 Just 66 seconds into the flight, Falcon Heavy will pass Maximum Dynamic Pressure where the used airframes on the two boosters and the reinforced structure of the central core will have to withstand the maximum stress as they make their way through the dense atmosphere. Given this mission’s profile, peak stress should be less than for a Falcon 9 rocket heading to Geostationary Transfer Orbit, Elon Musk said. The most critical event of the flight – aside from making it off the ground – will come two minutes and 29 seconds into the flight when the two boosters will shut down their nine engines and separate from the still-firing core four seconds after BECO. The two former Falcon 9 first stages will separate at the same time using non-pyrotechnic separation hardware and employing their cold gas attitude control systems to create a safe separation from the core. 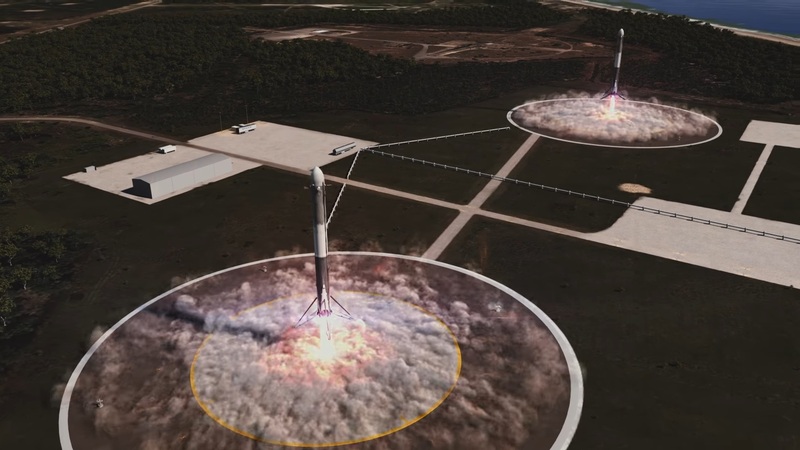 Separation of the two side cores will mark the beginning of near-simultaneous space acrobatics as the two will begin their return sequence to Cape Canaveral’s Landing Zones 1 and 2 where they are expected to land just 300 meters apart on two concrete landing pads. After separation, the thrust struts connecting the boosters to the core stage will retract into protective compartments on all three cores to keep them out of the harsh re-entry environment and so allow for post-flight inspections and re-use of the hardware. Relying on their Nitrogen thrusters, the two side cores will maneuver into an engines-first orientation immediately after separation since every second takes them further away from the coast. 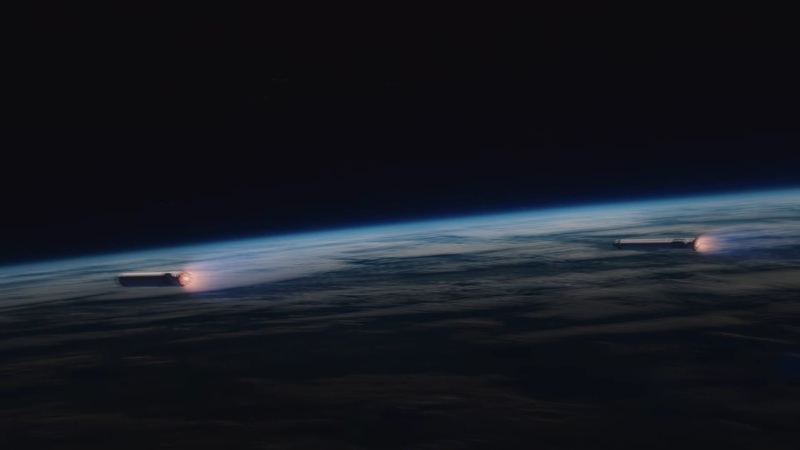 It is understood that their return sequence will be staggered by a few seconds with one booster holding off on the boostback burn to create a safe separation distance between the two as they make their way toward landing. Firing up three Merlin 1D engines around T+2 minutes and 50 seconds, the two boosters will reverse course to head back toward Cape Canaveral. The boostback burn is followed by three minutes of passive flight outside the atmosphere during which the boosters will deploy their four actuated grid fins and maneuver into the proper orientation for atmospheric entry. A brief Entry Burn of around 17 seconds starting at T+6:41 will allow each booster to hit the brakes prior to re-entry to lessen the aerodynamic and heat loads experienced when encountering the dense atmosphere at a speed upwards of Mach 3. Flying through the atmosphere without engine power for nearly a minute, the 48-meter tall boosters will be slowed to subsonic speed and use their grid fins to adjust their angle of attack and steer toward Landing Zones 1 and 2 at the former Space Launch Complex 13 some 15 Kilometers south of LC-39A. Half a minute before the anticipated touchdown, each booster will fire up its center engine to begin the process of arresting its vertical speed to come to a gentle touchdown on four fold-out landing legs that deploy in the final seconds of their return to Terra Firma, expected at T+7 minutes and 58 seconds. Residents and spectators have been informed by SpaceX that the planned return of the boosters will result in a pair of sonic booms. While the boosters go through the motions to head back to Earth, what is left hurdling toward orbit is essentially a partially-fueled Falcon 9 rocket. The central core will throttle its engines up after separation of the outer cores and fire for another 31 seconds to accelerate the vehicle. MECO is planned at T+3 minutes and 4 seconds, to be followed three seconds later by stage separation via four pneumatic pushers to send the two stages on their separate ways – the second stage immediately heads into start-up to proceed into a Parking Orbit while the Core Stage, Booster 1033, begins its high-energy return. Because of the additional energy provided by the outer cores, the central booster is looking at a much higher energy than Falcon 9 first stages performing Geostationary Transfer Orbit missions. Using its cold gas thrusters, the core will maneuver into position for a partial boostback maneuver taking advantage of this mission’s performance margins to limit the booster’s downrange travel distance and place the landing location closer to shore. B1033 will re-light at T+6 minutes and 47 seconds on the three-engine Entry Burn to slow itself down and create a survivable re-entry toward SpaceX’s ‘Of Course I Still Love You’ Drone Ship that will be holding position around 345 Kilometers from Cape Canaveral to catch its first Falcon Heavy core with touchdown anticipated at T+8 minutes and 19 seconds. The second stage will split open and drop its payload fairing three minutes and 49 seconds into the flight to shed no-longer-needed weight on its way into orbit, revealing the Roadster for the rest of its journey to depart the clutches of Earth’s gravity. Shutdown of the 95,000-Kilogram-force MVac engine is expected eight minutes and 31 seconds after launch, marking the start of a coast phase in a Low Earth Parking Orbit of around 200 Kilometers. In addition to demonstrating three-core flight environments, Tuesday’s Falcon Heavy mission also sets out to qualify the Falcon 9 second stage for direct Geostationary missions – an important step for SpaceX to be able to compete for all U.S. Air Force Missions including those requiring a direct injection. This type of mission profile would require the second stage to complete extended coast phases of 6+ hours, a feat not yet demonstrated by SpaceX and the Falcon Heavy mission was seen as a good opportunity. The second burn is expected to start at T+28 minutes and 22 seconds and last around 30 seconds to accelerate the vehicle into an elliptical Transfer Orbit with a period of around six hours to enable the long-duration coast test on the second stage while also setting up the proper location for the Earth Departure Maneuver. SpaceX did not disclose the exact timing of the mission’s third burn and no target orbit parameters were provided. 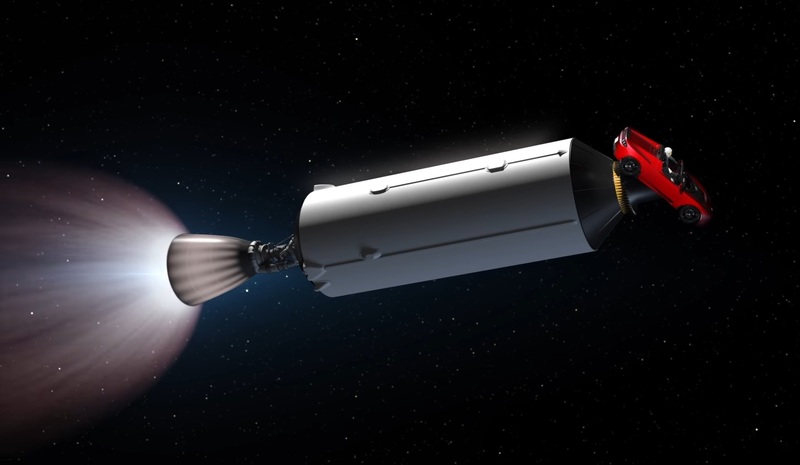 Firing up the MVac engine, the second stage will be tasked with accelerating the Tesla to a speed of 11 Kilometers per second, placing it into an elliptical orbit around the sun varying between the distance of Earth and the orbit of Mars, but not interfering with the planet for several hundred million years. The primary objective of Tuesday’s mission is validating Falcon Heavy’s overall performance and collecting real-world data to feed into models to refine the vehicle’s design before it can reach an operational stage. Data collected on Tuesday will be analyzed carefully by SpaceX in the weeks to come to identify any departures from existing simulations and highlight any potential weak points that have to be addressed prior to operational missions. 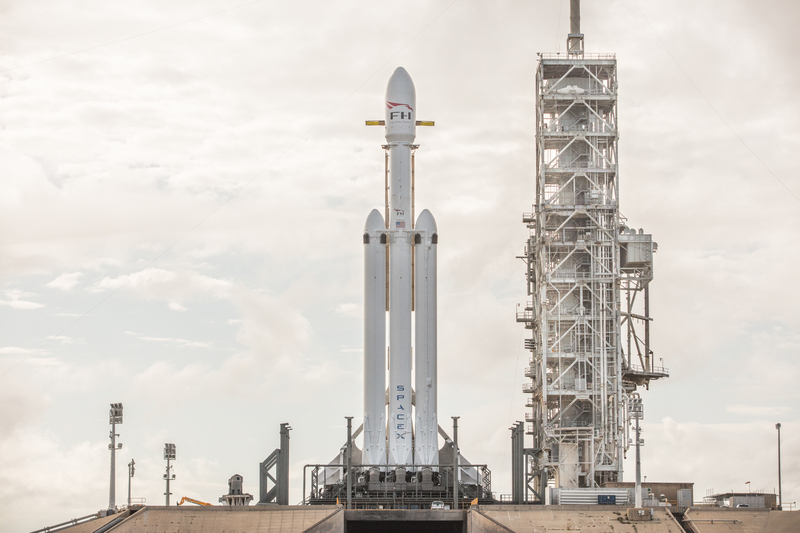 SpaceX currently has two more Falcon Heavy missions on the 2018 manifest – the U.S. Air Force Space Test Program 2 mission that will give the vehicle full EELV certification and the commercial launch of Arabsat 6A for Saudi Arabia.